Chicagoans won’t be celebrating St. Patrick’s Day in shorts this year. Though last year’s partiers celebrated in 80-degree temperatures, this year’s festivities remain chilly in the mid-30s. Saturday’s colder temps may be paired with drizzling rain or possible snow flurries, but is expected to remain fairly dry overnight and throughout Sunday. 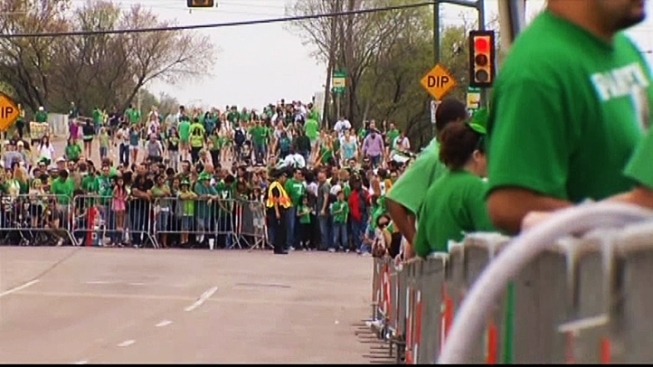 Chicago's annual St. Patrick's Day Parade steps off at noon Saturday in one of the country's largest parades for the Irish holiday. Just before the parade begins Chicago Journeymen Plumbers will continue their more than 40-year tradition and dye the Chicago River green. Sunday’s Irish festivities are expected to stay dry, but the calm weather won’t stay long as a new storm front heads for the Chicago area Monday afternoon.